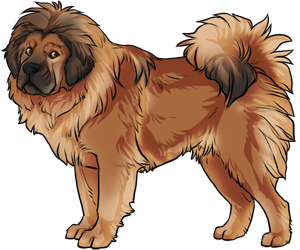 Though the origins of the Tibetan Mastiff are unclear, there are written accounts in 1100 BC China that may be it. It was isolated in the Himalayan mountains and evolved into the breed we know and recognize today. It was a property guard dog who was locked up during the day and let loose at night. They would guard the homes and tents of families when they moved their flocks to different pastures. In the 1800's, Queen Elizabeth received a puppy. She then imported more of the breed. Marco Polo described the dog as "tall as a donkey with a voice of a lion". The breed is now rare in Tibet.